I’ve mentioned The Great Pumpkin Project previously, and a timely note from Shellhawk has reminded me that it’s just kicked off again. Read all about their mission here and do your part to bring more random pumpkins to the world! Although he’s claiming that this is his last steampunk project, it doesn’t seem to mean that he’s retiring from the steampunk community. He’s just not planning to do any more mods involving “steampunkifying” modern objects. A pity; he has a definite gift. Y’know what’s irritating? Trying to find a photograph to accompany a blog post and discovering that there’s a book by the same title that everybody and their cousin has written about. I slogged through 37 pages of “the Hatfields and the McCoys sure didn’t like each other” to find this photo for you. I hope you’re happy. Coffin Quilts date from the days when people were rubbing up against death all the time, so it was treated a little more matter-of-factly than it is today. As with most other types of patchwork quilt, they appear to have originally been an American invention. They were usually done in somber shades of grey or brown and consisted of a plain center (the graveyard) surrounded by either pieced blocks (star, nine-patch, etc.) or by appliques such as a picket fence. These quilts were sometimes also embroidered with vines, flowers, and other funerary symbols. Now for the fun part: Appliques in the shape of toe-pincher coffins, each embroidered with the name of a family member, were loosely basted on the quilt’s border. When a relative died, the coffin bearing his/her name was removed and sewed permanently in the center or graveyard area, along with the date of death. Yeah, that’d be a hoot, wouldn’t it? Going to visit Aunt Agatha and seeing the little coffin with your name on it, just waiting…. Anyway, if you like to quilt (or would like to learn–it’s truly less daunting than you think), this would be a fun project. It’s nicely morbid, but can claim real historical roots if anyone complains. Depending upon your skill level you can choose a simple block (stick with squares or triangles that make up squares, like Churn Dash) or can go nuts with the appliques and make your own cemetery, complete with wrought-iron gates. There’s another couple of photos of the quilt above on Flickr. I don’t blog much about “gross-out” foods of the type that sometimes make an appearance at Halloween parties because they don’t really appeal to me, but I’m making an exception in this case because honestly my mind is sort of blown. The part that I found just completely mind-blowing is how in hell this ever got greenlit. I worked for Disney. They do not just casually roll out a new product. There are meetings. There are memos. Multiple levels of management are involved. There are planning sessions and recipe standardization and sample tastings and packaging decisions and requests for signage and employee training. At no point throughout this entire process did nobody in the decision-making chain go, “Um…?” Really? Nobody? According to SheKnows, the Tamarin poop was made from pretzel pearls, chocolate-peanut butter fudge, and sweet rolled oat flakes; the Elephant was chocolate-peanut butter fudge with sweet rolled oats and yellow coconut flakes; Giraffe was rolled chocolate fudge brownie and caramel; and Hippo was chocolate fudge-caramel brownie with peanut butter and rolled oats. Those combinations actually sound pretty tasty, and the candies are certainly easy enough to make and shape. The animal-poop thing might particularly appeal to kids (it’d be an amusing addition to a zoo- or safari-themed party). Or, y’know, serve it to your friends and then sit around wondering what the hell Disney management was thinking. The Little Joseph candleholder is a hand-painted ceramic doll’s head that probably moves around on its own at night. Although the commercially-available version is, uh, pricey,* there are a variety of ways that something reasonably similar could be made at home. The easiest method would be to get a ceramic doll head (available at dollmaking suppliers, eBay, some craft stores, and occasionally at thrift shops) and epoxy a small disc-type candleholder to its noggin. If you have access to a hole saw, you could drill a candle-sized hole in the top instead. If you’d rather make something a little more custom, look around for a “make your own pottery”-type store in your area (they seem to pop up like mushrooms). Get an unfired (greenware) doll head, drill a hole in the top, paint as desired, and have the store fire it for you. Make sure that the doll head has a steady base or is carefully secured; you don’t want it rolling over with a lit candle inside. The finished effect is nicely creepy, especially after some wax has built up; you can see some additional photos here. *I wouldn’t spend $100 on a candleholder that didn’t give people the fantods, let alone something I had to hide when my mom came to visit. You guys! I don’t usually share region-specific attractions but the Bronx Zoo in NY has a Bug Carousel and it is the best thing ever. 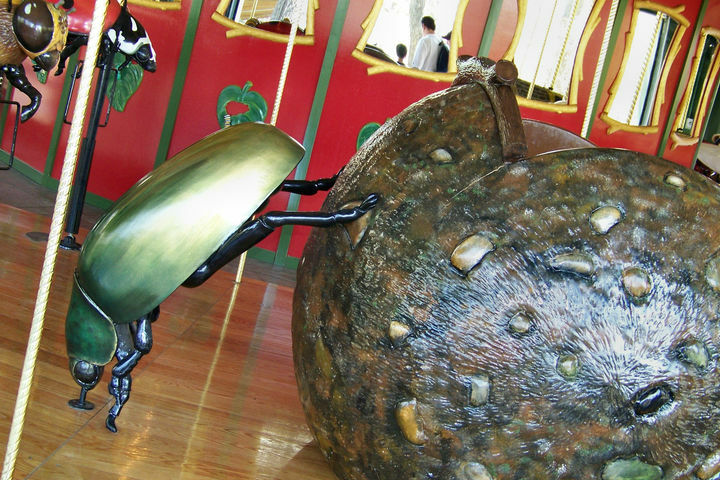 The “first and only entirely insect carousel” is adjacent to the zoo’s butterfly exhibit, and you can ride on the back of a praying mantis, ladybug, grasshopper, and several other lifelike giant insects. The carousel also has two stationary “chariot” seats, one of which is utterly brilliant. The Carousel Works site has some additional information, and if you search Google Images for bug carousel there are loads of photos. I’ve occasionally seen kits and DIY projects for making miniature carousel toys. It’d be fun to replace the horses with insects (or arachnids; a spider, scorpion, tick, and mite merry-go-round would be entertaining), particularly if it was tucked in a normal-seeming train layout or diorama. You gotta give it to the Victorians: When it came to death, they did not believe in half measures. There were strict rules about proper mourning attire, and one essential accessory was the mourning handkerchief. The handkerchiefs were traditionally white, trimmed with a black border; the border width varied depending upon how long one had been in mourning. (There were rules about that, too. The customary mourning period of a widow for her husband, for instance, was a total of 2 1/2 years: First Mourning, 1 year and 1 day in bombazine and heavy crape; Second Mourning, 9 months with less crape; Ordinary Mourning, 3 months in black silk; and Half Mourning, a minimum of 6 months where “half mourning colors” like grey and purple were allowed, and a greater variety of fabric and trim was permitted.) A proper handkerchief would sport a heavy black band during First Mourning, after which narrower bands could be used. As with most customs, eventually there were embellishments. The handkerchiefs might be made of delicate lace or feature embroidery and fancy fabric. Handkerchiefs are easy to make–there are good instructions here and here–but you can also start with a premade handkerchief and add lace, ribbon, or embroidery. Tutorials for all of these techniques are just a quick google away. It’s always a good idea to have a hanky on hand, and one with gothy overtones is even better. I found a somewhat similar book that was previously available on Etsy from which it’s possible to glean a little more of the general construction. Get a large hardback book from a thrift store; if it’s a little battered-looking, so much the better. If you intend to display the book opened flat or with the cover only slightly visible, just spray-paint the cover black (cover the edges of the pages with masking tape if you’re concerned about overspray). If the cover is going to be visible, you may want to decorate it further. Open the book to the middle, place it at the angle it’s going to be displayed at, and liberally paint white glue or Mod Podge around the edges of the pages to stick them all in place. (If desired, before this step you can spray all of the edges with water and let them dry so they’re a little more crinkly and old-looking.) There’s a good step-by-step tutorial for making an open-book spellbook here, to give you a general idea of what you’re shooting for. Distress the edges of the pages and add fake text to the visible top pages, if desired. This site has good instructions for doing that. 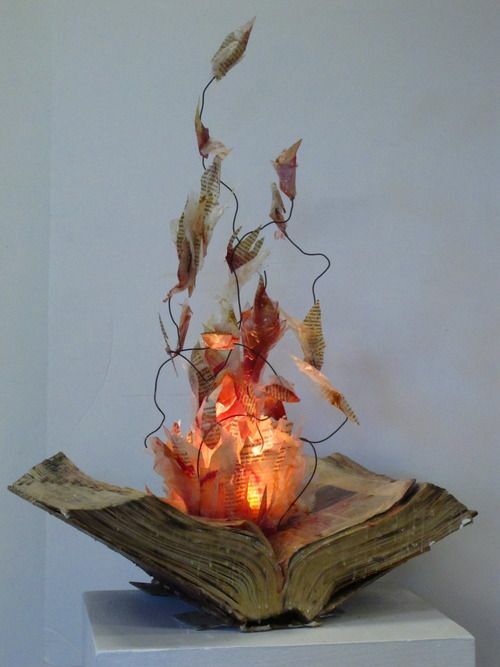 Use an X-Acto knife to cut a hole in the center of the pages, large enough to accommodate a flickering LED tea light. Cut scraps of paper and glue them around the edges of the hole; stiffen them with a little Mod Podge if necessary. Build them up and out so they’ll hide the tea light, but don’t make them so dense that they hide the flicker. You could use paper with text for the outer edges and thin tissue paper for the inner stuff. 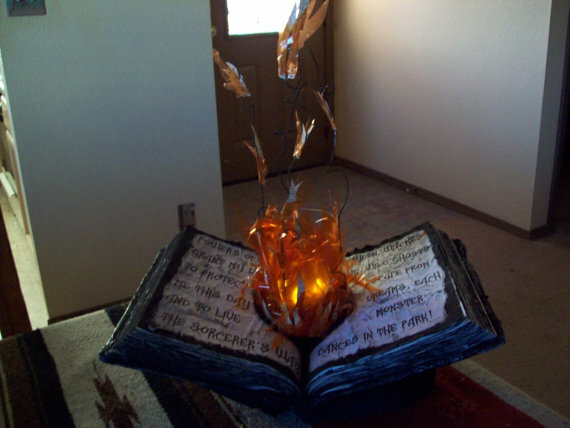 You might also try tucking in a bit of red or orange cellophane to suggest flames. Make a few twists of black wire and attach tufts of scrap paper to one end of each. Hot-glue the other ends amongst the bits of scrap paper around the edge of the hole. Nestle the tea light inside and you’re good to go. It’s a reasonably straightforward project; the hardest part would be making the central combusty bit look right. It might be worth doing a couple of test runs of just that part on other thrifted books before committing to the full paint job.